Many can agree that – in general – quality of sound trumps quantity (volume). But sometimes it's hard to say no to that inner craving for more bass, where one can feel the music as much as hear it. And when it comes to subwoofers, small nudges of volume can go a long way. Too much, and the bottom ends of audio tracks can start to transform into a bloated, boomy mess. We all deserve better than that. And you don't necessarily need to spend more to get more. There is indeed a sweet spot to find, where a subwoofer can play at its best. And this will vary, depending on a room's contents and unique size and shape. You'll know you have it right when the bass gets as close as possible to feeling like an evenly-spread blanket, yet blends with and maintains balance with the other speakers. 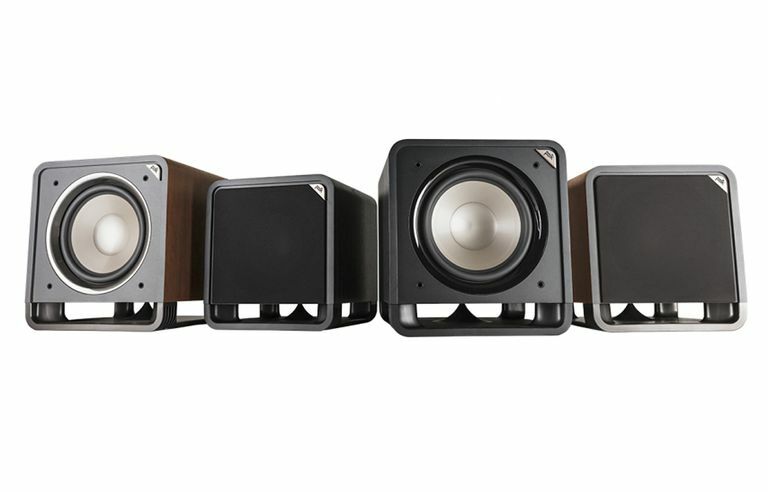 Getting the best performance from the subwoofer involves three simple steps (with some patience): correct subwoofer placement, proper connection, and careful adjustment. Just like in real estate, it's all about location, location, location. Correct placement is important for all speakers, including the subwoofer. However the subwoofer is generally the most difficult speaker to position, and you can't just tuck it anywhere and expect it to perform at its best. If you haven't already set the main speakers, start with the basic instructions to get that done first. Then continue on to correctly place the subwoofer. Keep in mind that extension cords might be necessary to reach power outlets. Just because a subwoofer looks good sitting in a spot, it doesn't mean it will also sound good there. Place the subwoofer between the two main speakers, away from the front wall. This tends to be easy for space and room aesthetics, so try it out first. Place the subwoofer on a side wall, halfway between the front and rear walls. This spot can often be quite effective and can serve as the ideal set-up for a listening room. If neither of those positions works out well, then it's time to get on hands and knees and "crawl for bass." This technique involves moving the subwoofer slowly about the room while listening for the best bass reproduction. This can be somewhat tedious because sound waves reflect off of walls and objects. These reflections can reinforce or cancel each other out, and the last thing you'll want is a null (or amplified) zone in your favorite listening spot. Trust that your ears will hear the ideal placement for the subwoofer. Depending on the brand and model owned, there might be more than one way to hook a subwoofer up to a system. For example, it could have (but not limited to) left/right, "line in," or "sub input" for connections. If a cable has to encounter other wiring, do your best to have them cross at 90 degrees. Generally, there are two ways to connect a subwoofer to a stereo or home theater system. Once the subwoofer is in the ideal spot, you'll want to further tune it for the best sound. Follow these steps to get that done. Before playing the subwoofer, adjust the crossover. If you are using large floor standing main speakers, set the subwoofer's crossover in the range of 40Hz-60Hz. If using smaller bookshelf speakers set the crossover at 50Hz-80Hz and for small satellite speakers set the crossover at 80Hz-160Hz. Turn on the power and set the subwoofer volume to the desired level. Adjust phase control if available. The phase control compensates for a delay between the subwoofer and the main speakers. Start with the phase control in the 0 or normal position. If the sound from the subwoofer is adequate from the listening position, no further adjustment is necessary. If the sound is thin or lacking bass, adjust the phase control until the bass is satisfactory. Finally, make small adjustments to the stereo audio equalizer for preferred sound.